I’m following a young (I think) blogger who seems amazing to me. She writes two or three posts a day. And I’m not saying she posts someone else’s quote or inserts a short little post. No. This girl writes page after page of stuff. Every day. Two or three times. It’s enough to make you feel inadequate. Or at least wondering jwtf she does in her spare time, if she has any. So I thought I’d make two posts today. Narami hosts a “Textures of Tuesday” Photo Challenge. And I’m joining in her challenge today with this photograph of the outrageous rock formations found in Monument Valley, Utah, lying inside Navajo tribal territory. The Navajo call it “Tse Bii’ Ndzisgaii” which unsurprisingly translates to “valley of the rocks.” If you’ve ever seen a John Wayne western, you’ve seen him ride his horse through Monument Valley. 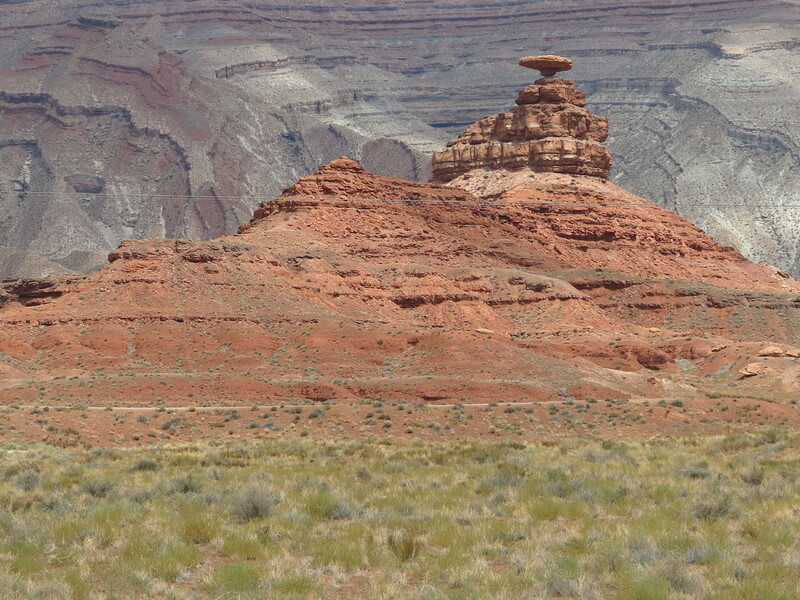 Just so you get an idea of scale, the top rock, balancing on the others, is about the size of a Greyhound bus. If you look closely at the bottom of the brown pile of rock, you’ll see a thin, horizontal tan line: that is the dirt road I’m on. i really like that picture, baddish. it really captures the challenge of texture very well! Debbie, yeah, when I drove around the bend on that dirt road and came across that pile of rocks, a chill went up my spine. After the dust settled back down onto the road, I snapped this in mid-afternoon sun. I would have preferred a-little-later-in-the-day light, but sometimes you have to take what you are given. And I wouldn’t have imagined it for a “texture” shot, but it does have three distinctly different textures. HI, sometimes places just give you that tingly feeling don’t they. it really comes through in the photo. What an absolutely beautiful display of texture. So many superb photo ops in Monument Valley. Ha! You are right about the photo ops. I probably took 2 or 3 thousand shots while there. Many cannot show what I saw and felt. But I have a few that I truly like. Love the photo badfish, great depth of field. I would like to go see that place! Alison, I was wondering if you might like this photo a little more than the overly-saturated rice field. The shot was at f5.8, but at that distance everything would have been in focus, I think. Funny thing is I just noticed that it was shot at 1/500. Why would I do that? I think it was a cloudy day, but 500? Of all the places I’ve been in the US, Monument Valley sits in the top ten favorites, right up there with sleeping overnight on top of Haleakala and backpacking down Bright Angel Trail in the Grand Canyon. The link worked for me yesterday…but not today.I think it is now fixed. In this photo I think the background is a slightly blurred but I like that. I just re-read what you wrote and it finally sunk in that the top rock is the size of a bus! Wow! Thats some landscape. Yes the link works now. Can we have a link to the blogger who posts 2 or 3 times a day? Who is that? Im intrigued. Alison, it is just outrageous landscape there, unique but not quite those sandstone pillars in China that I want to visit some day. If you look close below the the formation, you see a thin tan line. That is the dirt road, it would have been good to have a car or something in the photo for scale. Also, if you look at the sky, you see a wire. Wires are always in my shots!!! Wires follow me around the world. Wires are what is going to make me learn LR. I can’t tell if the background is blurred, or just far away. You have very good eyes. What I like is the three distinct colors and feels of ground. Today she has just posted a Youtube video. Funny, but not her usual pages of stuff. The road *really* puts things into perspective! Yes, it is pretty amazing. And all that area around where you were in NM (I think) in the four corners area of the South West. Still, a photo (for me) never quite replicates the experience of being there. But it can evoke the spirit of the place, and bring back the emotion of the place in my mind. You might feel similar about your “gorge” shot, awesome but missing 40 miles of land to the horizon. And I, for one, liked that you made me click to see it bigger. Some shots seem better large. Yours looked really cool in the small size, too. It’s a big country. And I am lucky…on so many levels!! All of South Utah should be declared a National Park. It is absolutely breath taking! Great post…..ah. So beautiful.